My main interest has been live looping. 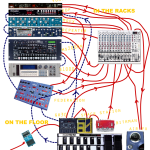 I started back in the 80´s with the classic two tape machine, as invented by Terry Riley, used by Eno on Discreet Music, and appropriated as “Frippertronics” by Robert Fripp) You can see the diagram of my set-up back then below. Now I do everything digitally, and LOVE the echoplex digital Pro, or EDP. I have 2. My latest rack, with clever “magic Box” rack that unfolds to 3 times its size. 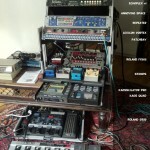 If you count the Kaos pads I now have 6 loopers in my rack, if you are talking looping “tracks” I have 12 tracks! This set-up was roughly what I was using from 2005. I still have this rack and occasionally plug it in. For the meantime, however software has taken my fancy. My son 8 month Nikolas just found an old book on the shelf. “Concepts of Modern Art”. 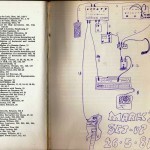 And in the back cover was a diagram of the equipment set-up I had in 1981. So here it is reproduced as is, with annotations. Even MORE incredible, is this Elborough en-scribed document (nicked from the Uncle Ian pages- any chance of a bigger scan Nick???) 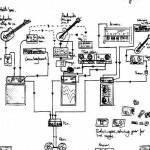 This shows the complete band set-up for the Uncle Ian recording – The Urban Picnic. The weird thing is that if I compare it with what I use NOW.. over 20 years later, its REMARKABLY similar! I made alot of VST Plugins for a while, mostly as a compliment to AudioMulch. Making what I need for a particular track. Most of my release The Money Hush Room was made with these plugins. They were all built using the excellent Synth Edit. I am not sure if they work in ANY other host, but would be interested to know if they do. Please take them and play with them … completely free!! !